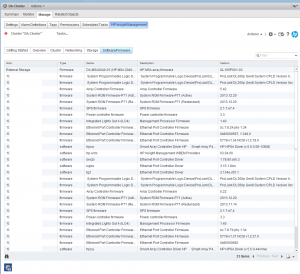 VMWare vSphere iSCSI Port Binding – When to use iSCSI Port Binding, and why! While doing some semi-related research on the internet, I’ve come across numerous how-to and informational articles explaining how to configure iSCSI MPIO, and advising readers to incorrectly use iSCSI port binding. I felt the need to whip up a post to explain why and when you should use iSCSI port Binding on VMware vSphere. This post applies to all versions of VMware vSphere, including 5, 5.5, 6, 6.5, and 6.7.
iSCSI port binding binds an iSCSI initiator interface on a ESXi host to a vmknic and configures accordingly to allow multipathing in a situation where both vmknics are residing in the same subnet. In normal circumstances without port binding, if you have multiple vmkernels on the same subnet, the ESXi host would simply choose one and not use both for transmission of packets, traffic, and data. iSCSI port binding forces the iSCSI initiator to use that adapter for both transmission and receiving of iSCSI packets. In most simple SAN environments, there are two different types of setups/configurations. Multiple Subnet – Numerous paths to a storage device on a SAN, each path residing on separate subnets. These paths are isolated from each other and usually involve multiple switches. Single Subnet – Numerous paths to a storage device on a SAN, each path is on the same subnet. These paths usually go through 1-2 switches, with all interfaces on the SAN and the hosts residing on the same subnet. A lot of you I.T. professionals know the the issues that occur when you have a host that is multi-homed, and you know that in normal typical scenarios with Windows and Linux, that if you have multiple adapters residing on the same subnet, you’ll have issues with broadcasts, and in most cases you have absolutely no control over what communications are initiated over what NIC due to the way the routing table is handled. In most cases all outbound connections will be initiated through the first NIC installed in the system, or whichever one is inside of the primary route in the routing table. This is where iSCSI Port Binding comes in to play. If you have an ESXi host that has vmks sitting on the same subnet, you can bind the iSCSI initiators to the physical NICs. This allows multiple iSCSI connections on multiple NICs residing on the same subnet. One subnet, iSCSI port binding is the way to go! Two or more subnets, DON’T USE ISCSI PORT BINDING! It’s just not needed since all vmknics are residing on different subnets. When I first started really getting in to multipath iSCSI for vSphere, I had two major hurdles that really took a lot of time and research to figure out before deploying. So many articles on the internet, and most were wrong. In this article I’ll only be getting in to the first point. I’ll be creating another article soon to go in to detail with the second, but I will say right now in this type of configuration (using multiple subnets on multiple isolated networks), you DO NOT use iSCSI Port Binding. Configuring a standard (non distributed) vSphere Standard Switch is easy, but we want to do this right, right? By configuring a vSphere Distributed Switch, it allows you to roll it out to multiple hosts making configuration and provisioning more easy. 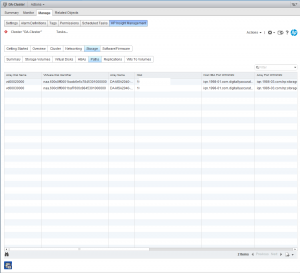 It also allows you to more easily manage and maintain the configuration as well. In my opinion, in a fully vSphere rollout, there’s no reason to use vSphere Standard switches. Everything should be distributed! My configuration consists of two hosts connecting to an iSCSI device over 3 different paths, each with it’s own subnet. Each host has multiple NICs, and the storage device has multiple NICs as well. -I always draw a map that explains what’s connecting to what. When you start rolling this out, it’s good to have that image in your mind and on paper. If you lose track it helps to get back on track and avoid mistakes. So no we know where everything is going to sit, and it’s addresses. It’s now time to configure a vSphere Distributed Switch and roll it out to the hosts. 1) We’ll start off by going in to the vSphere client and creating a new vSphere Distributed Switch. You can name this switch whatever you want, I’ll use “iSCSI-vDS” for this example. Going through the wizard you can assign a name. Stop when you get to “Add Hosts and Physical Adapter”, on this page we will chose “Add Later”. Also, when it asks us to create a default port group, we will un-check the box and NOT create one. You’ll notice that the iSCSI-02 port group, only has the iSCSI-02 uplink marked as active. Also, the iSCSI-03 port group, only have the iSCSI-03 uplink marked as active. The same applies to iSCSI-01, and any other links you have (more if you have more links). Please ignore the entry for “iSCSI-04”, I created this for something else, pretend the entry isn’t there. If you do have 4 subnets, and 4 NICs, then you would have a 4th port group. 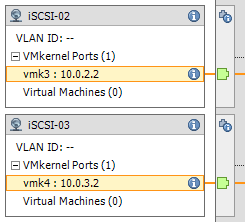 So here we are now, we have a vSphere Distributed Switch created, we have the port groups created, we’ve configured the port groups, and the vDS is attached to our hosts… Now we need to create vmks (vmkernel interfaces) in each port group, and then attach physical adapters to the port groups. 5) Head over to the Configuration tab inside of your ESXi host, and go to “Networking”. You’ll notice the newly created vSphere Distributed Switch is now inside the window. Expand it. You’ll need to perform these steps on each of your ESXi hosts. Essentially what we are doing, is creating a vmk on each port group, on each host. Click on “Manage Virtual Adapters” and click on “Add”. We’ll select “New Virtual Adapter”, then on the next screen our only option will be “VMKernel”, click Next. In the “Select port group” option, select the applicable port group. You’ll need to do this multiple times as we need to create a vmkernel interface for each port group (a vmk on iSCSI-01, a vmk on iSCSI-02, etc…), on each host, click next. Since this is the first port group (iSCSI-01) vmk we are creating on the first host, we’ll assign the IP address as 10.0.1.2, fill in the subnet box, and finish the wizard. Create another vmk for the second port group (iSCSI-02), since it’s the first host it’ll have an IP of 10.0.2.2, and then again for the 3rd port group with an IP of 10.0.3.2. After you do this for the first host, you’ll need to do it again for the second host, only the IPs will be different since it’s a different host (in this example the second host would have 3 vmks on each port group, example: iSCSI01 – 10.0.1.3, iSCSI02 – 10.0.2.3, iSCSI03 – 10.0.3.3). 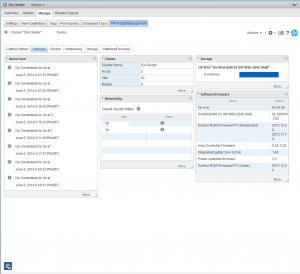 Here’s an example of iSCSI02 and iSCSI03 on ESXi host 1. Of course there’s also a iSCSI-01 but I cut it from the screenshot. As mentioned above, you need to do this on both hosts for the applicable vmnics. You’ll want to assign all 3 (even though I’ve only assigned 2 in the above screenshot). 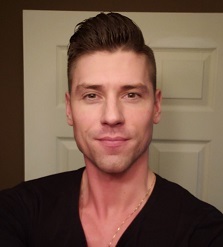 Voiala! You’re done! Now all you need to do is go in to your iSCSI initiator and add the IPs of the iSCSI target to the dynamic discovery tab on each host. 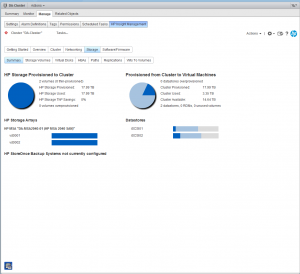 Rescan the adapter, add the VMFS datastores and you’re done. If you have any questions or comments, or feel this can be done in a better way, drop a comment on this article. Happy Virtualizing! 1) Under “Inventory” and “Networking”, Right Click on the newly created Distributed Switch. Under the “Properties” tab, select “Advanced” on the left hand side. Change the MTU to the applicable frame size. In my scenario this is 9000. 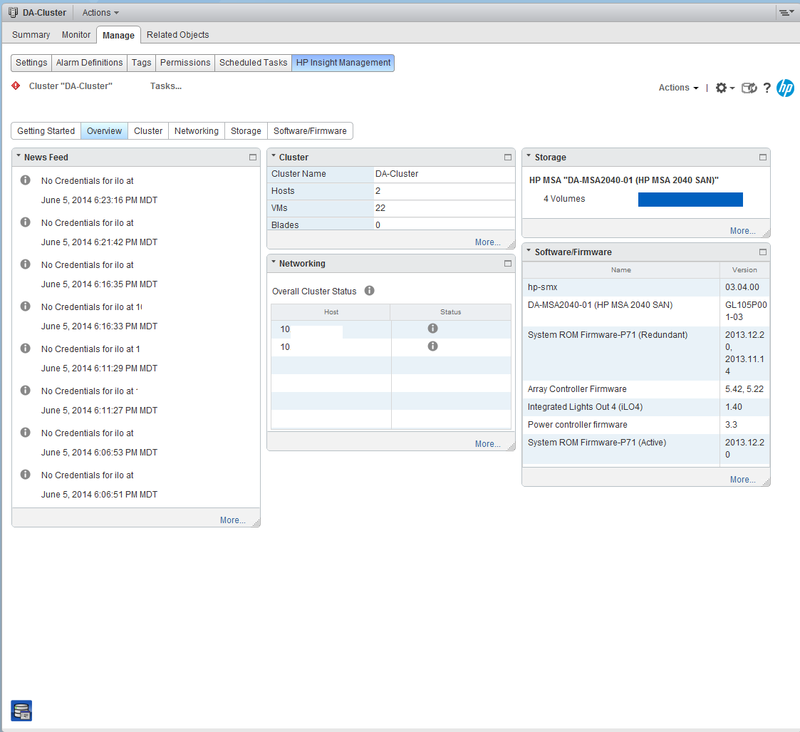 2) Under “Inventory” and “Hosts and Clusters”, click on the “Configuration Tab”, then “vSphere Distributed Switch”. 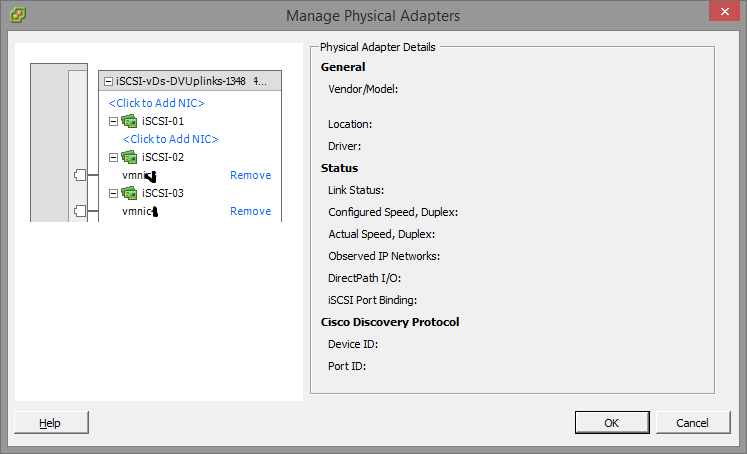 Expand the newly created “Distributed Switch”, select “Manage Virtual Adapters”. Select a vmk interface, and click “edit”. Change the MTU to the applicable size, in my case this is 9000. You’ll need to do this for each vmk interface on each physical host. And you want more visibility, functionality, and more important “Insight” on your systems where the hardware meets the software. This is where HP Insight Control for VMWare comes in to play. This package is amazing for providing information and “Insight” in to all your equipment, including servers and storage units. It allows you to update firmware, monitor and manage servers, monitor and manage storage arrays, and rapidly deploy new data stores and manage existing ones. 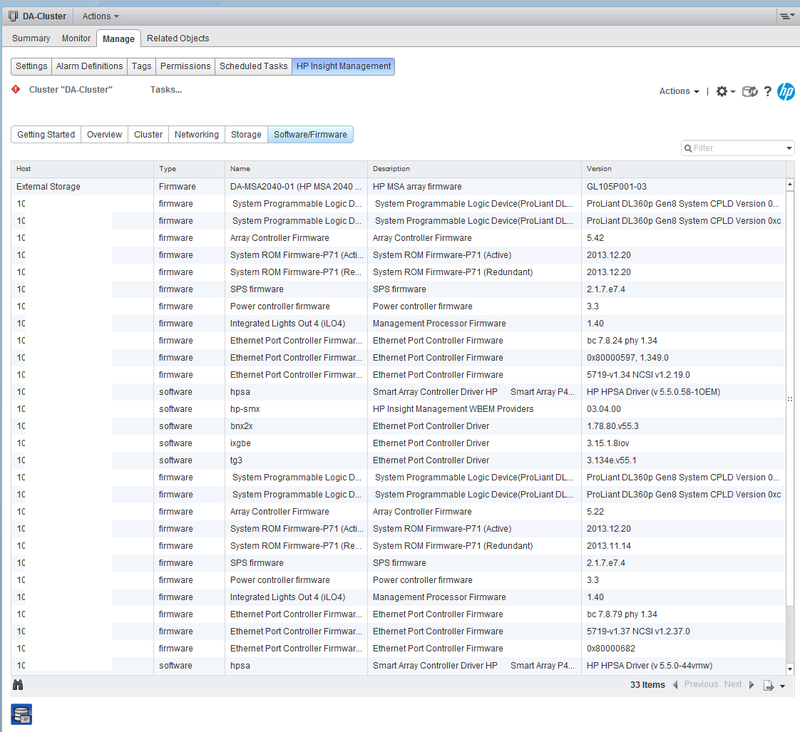 It makes all this information and functionality available via the vSphere management interfaces, which is just fantastic. I was browsing the downloads area on HP’s website for the MSA 2040, and the website told me I should download “Insight Control for VMWare”, I figured why not! After getting this package installed, I instantly saw the value. 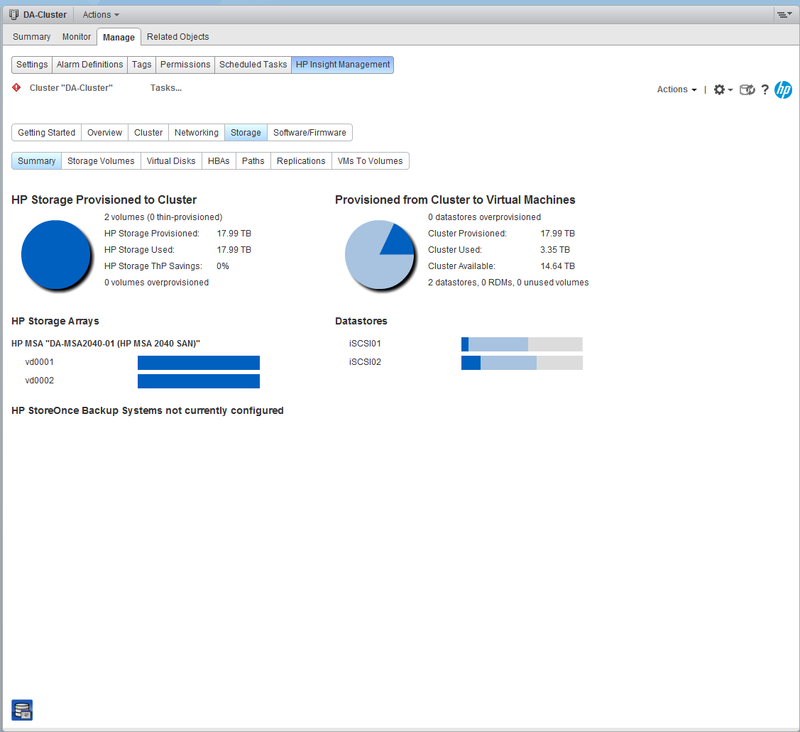 HP Insight control for VMWare, allows you to access server health, management, and control, along with storage health, management, and control. 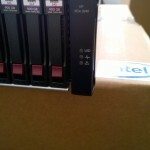 It supports HP servers with iLo, and fully supports the MSA 2040 SAN. Installation was a breeze, it was installed within seconds. I chose to install it directly on to my demo vSphere 5.5 vCenter server. Barely any configuration is required, the installation process was actually a few clicks of “Next”. Once install, you simply have to configure iLo credentials, and then add your storage system if you have a compatible SAN. Even adding your SAN is super easy, and it allows you to choose whether you want Insight Control to have full access to the SAN (which allows you to create, and manage datastores), or only Read Only, which only allows it to pull information from the unit. 3500,3501, 3502, 3503, 3504, 3505, 3506, 3507, 3508, 3509, 3510, 3512, 3513, 3511, 8090. 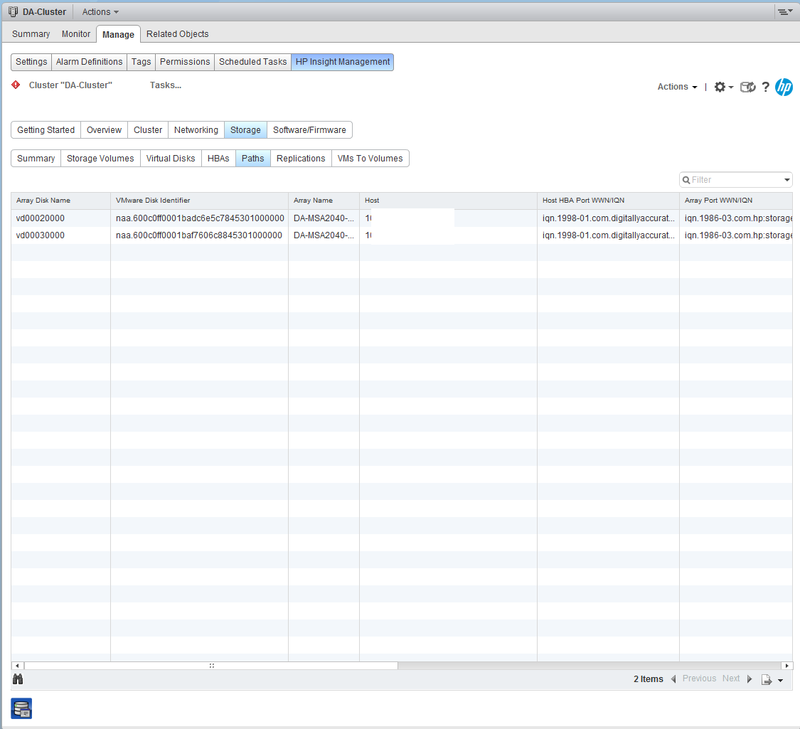 The Insight Control for VMWare is available through both the software client, and the web client. As far as I’m concerned it’s a “must have” if your running HP equipment in your vSphere environment!